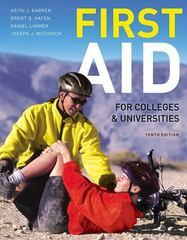 First Aid for Colleges and Universities 10 Edition First Aid for Colleges and Universities , Tenth Edition, is intended for students in a full-semester course leading to First Aid/CPR certification. It is designed specifically for college-level courses in First Aid and meets American Red Cross guidelines, while providing more depth and detail than the other available texts in the market. In addition to comprehensive coverage of all first aid situations a responder is likely to encounter, this book provides self-tests, critical thinking exercises, and skill assessment checklists. The Tenth Edition features updated content aligned with the new 2010 AHA and ARC CPR Guidelines, which affect many critical procedures in the entire field. Content also reflects the current developments, updated pedagogy, and best practices. Illustrations and photos have also been selectively updated and refreshed throughout the book.